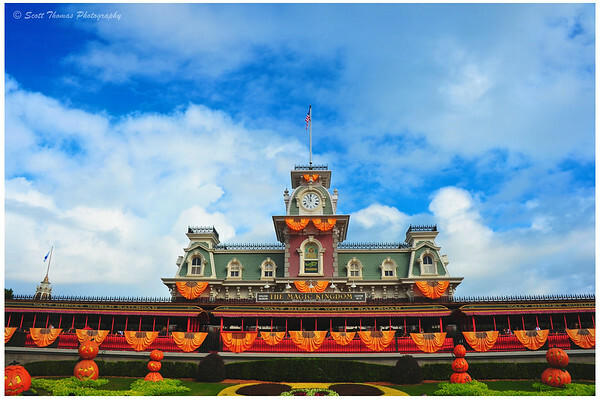 The Magic Kingdom's Main Street Train Station decorated for Halloween In Walt Disney World, Orlando, Florida. I liked it so much last year, I am going back to enjoy another Halloween at Walt Disney World. Halloween is not the only reason I am going. You may recall me mentioning earlier this year, I will be attending Pixelmania for the next few days. You can follow my adventures on my Disney Twitter account, @Scottwdw. This entry was posted in Travel and tagged 18-200mm vr, 28-300mm, halloween, mickey's not so scary halloween party, nikon D700, pixelmania, twitter, vr, walt disney world. Bookmark the permalink. Now a challenge for the Challenger…. I got a photo of that on a previous trip but it was so-so. If I see, I’ll do my best to get a photo of it! Hey! I know that place!! We just got back and are heading out again Thursday. Maybe we’ll run into each other! Have a great time! The last time we were there, my online friend, Renae, and I literally ran into each other! My family walked up and stood directly behind her at Minnie’s house and I recognized her from photographs. 🙂 It was very cool. Hoping that your path crosses with Scott’s! I remember that! It’s a small world in the blogosphere! Jealous of all these trips to Florida! Are the Mickey Mouse bushes in the front Halloweened-up too?It almost appears as though Mickey’s eyes are glowing red! Yep, the whole park is transformed to Halloween and autumn colors. Have a great time Scott, looking forward to seeing your photos when you get back. Thanks, Nye. Will take me a few days to see which ones I’ll be keeping. Took a lot of photos since that was the object of this trip. Much more than I normally do. That sure sounds like fun! When are you going to Disney Hawaii?